A member of 'Preferred Hotels & Resorts', this hotel achieves the quality and luxury that has come to be expected of the successful Thanos group of hotels. 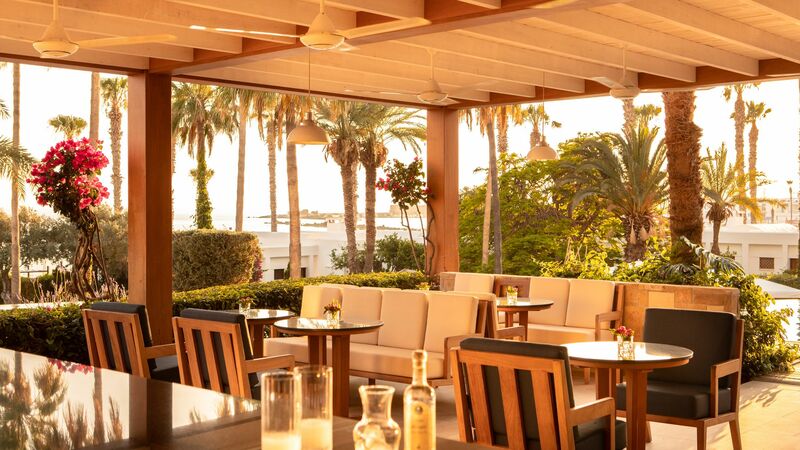 Set right on the Mediterranean, the Annabelle Hotel is a relaxing hotel perfect for couples and those wanting to relax and enjoy a sense of glamour. The rooftop area includes a bar, lounge, swimming pool, and al fresco terrace where you can relax as you look over the glittering ocean. Those wanting to fully relax can wander through the gardens, waterways, waterfalls, and pools of the Grotto, or head to the rooftop spa. Alternatively, try tennis or squash on the courts, or choose from a range of delicious cuisines for breakfast, lunch, and dinner. This elegant restaurant serves delicious Mediterranean dishes throughout the day. There is a large terrace overlooking the sea, perfect for al fresco dining in the summer. The dress code is smart casual evening attire, which includes no beachwear, shorts, flip flops or beach sandals. 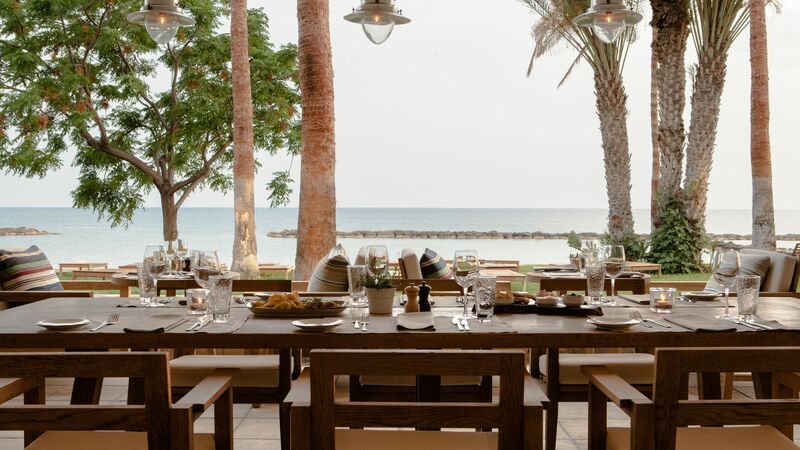 Guests staying on Half Board can have dinner at this restaurant or can swap for a €30 credit per adult, per day for either lunch or dinner in the a la carte restaurants at both the Annabelle and Almyra hotels. 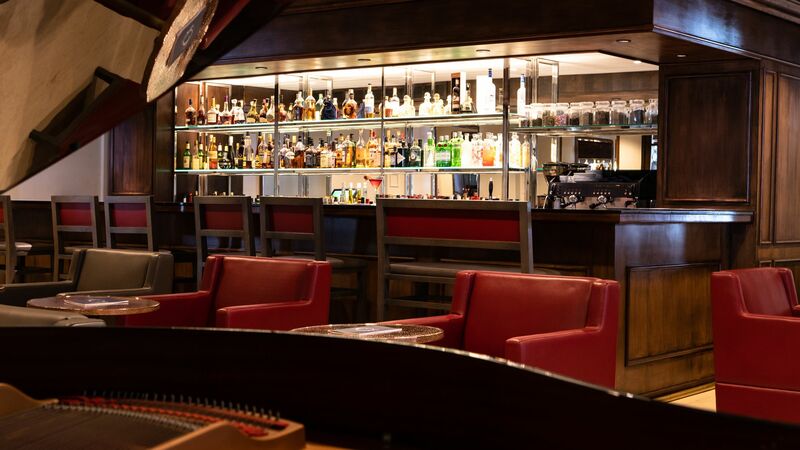 This cosy bar is the perfect place to enjoy a menu of liquors, cocktails, fine wines and champagne after dinner. Light evening entertainment, including music and singing, is also included. This elegant restaurant is decorated in chic blues and whites and offers beautiful views of the Mediterranean, the swimming pool and the hotel’s gardens. Choose from light meals, including salads, sandwiches and chefs specials. The dress code for lunch is casual while for dinner smart casual is required, with no shorts, flip flops or beach sandals permitted. 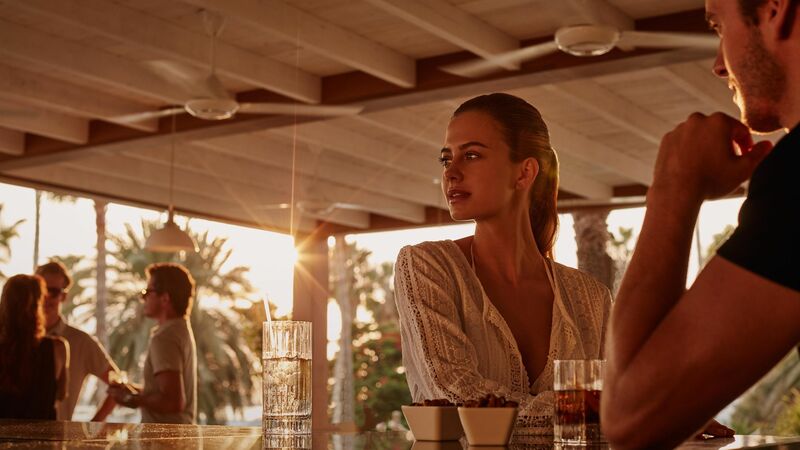 A relaxing rooftop lounge and bar with beautiful views of the Mediterranean from its outdoor terrace, this is the ideal place to unwind. Choose from sharing plates and afternoon tea, as well as a drinks menu. The lunch dress code is casual. For dinner guests are not permitted to wear beach sandals, flip flops or shorts. This intimate restaurant offers candlelit dining and a romantic atmosphere, with delicious fresh local menus created by expert chefs. The dress code is smart casual and guests are not permitted to wear shorts, flip flops or beach sandals. 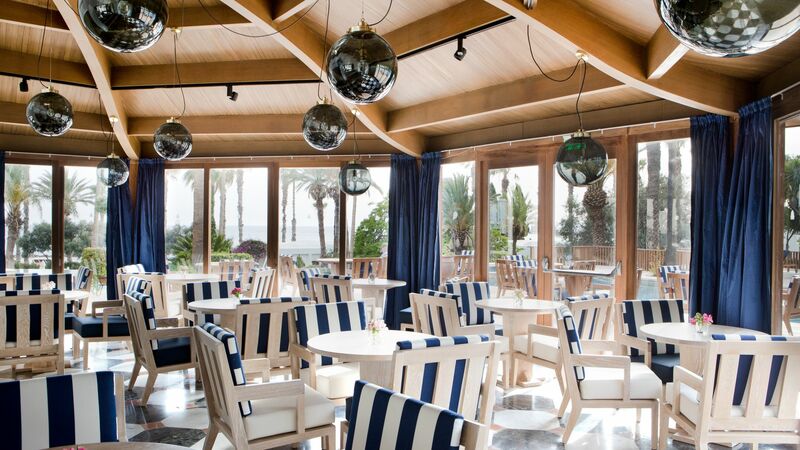 Located on the seafront, this restaurant is built in the style of a traditional Cypriot taverna. A weekly Greek themed night means you can try a range of local cuisine, with local flavours and traditional options served with a modern twist. 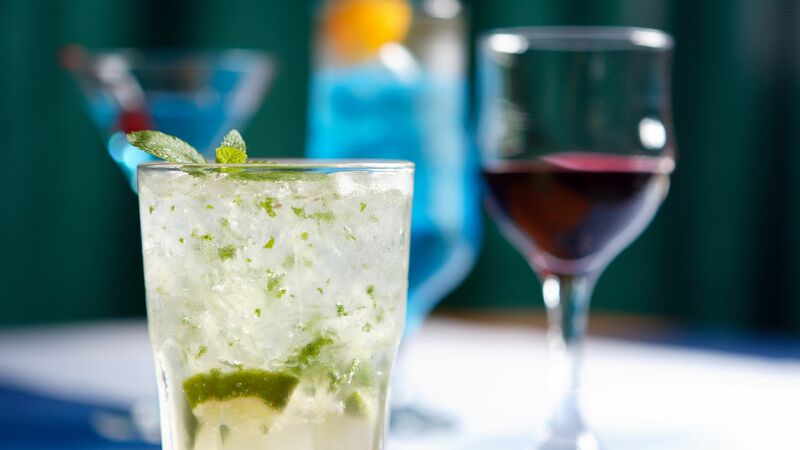 Relax on sun loungers or the al fresco terrace as you choose from a range of drinks and light bites throughout the day. Tucked away in the luscious hotel gardens and surrounded by waterfalls and swimming pools, the Grotto Bar is perfect for refreshing drinks. 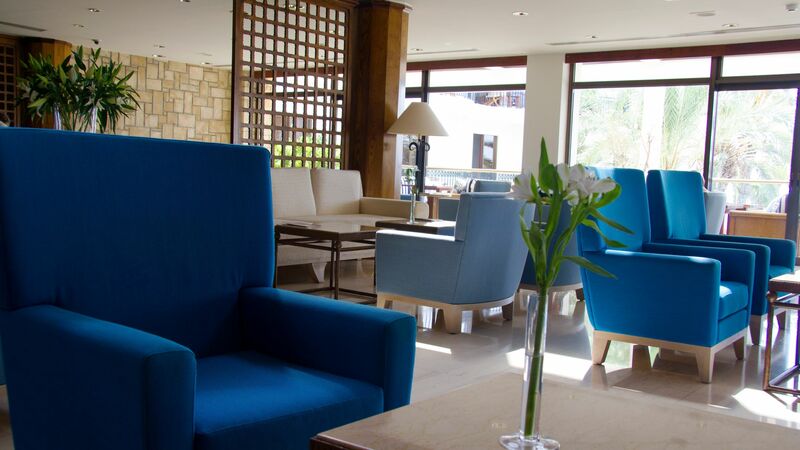 Choose from a range of drinks and snacks as you overlook Paphos Harbour and the sparkling Mediterranean. 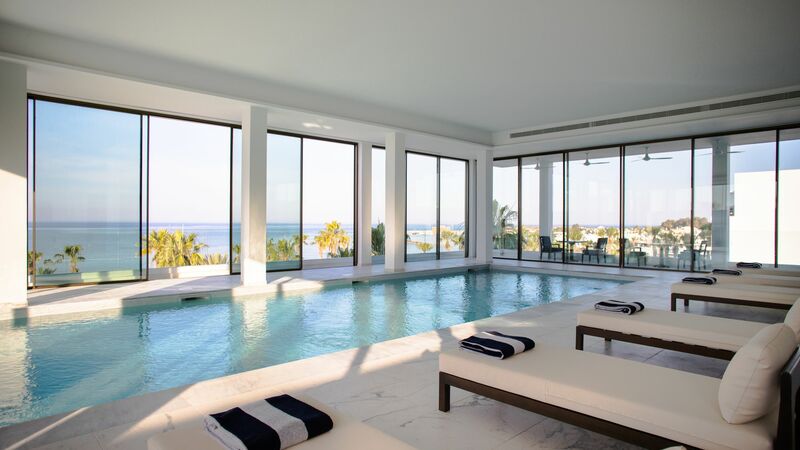 The main swimming pool is surrounded by sun loungers and offers the perfect chance for a cooling dip. 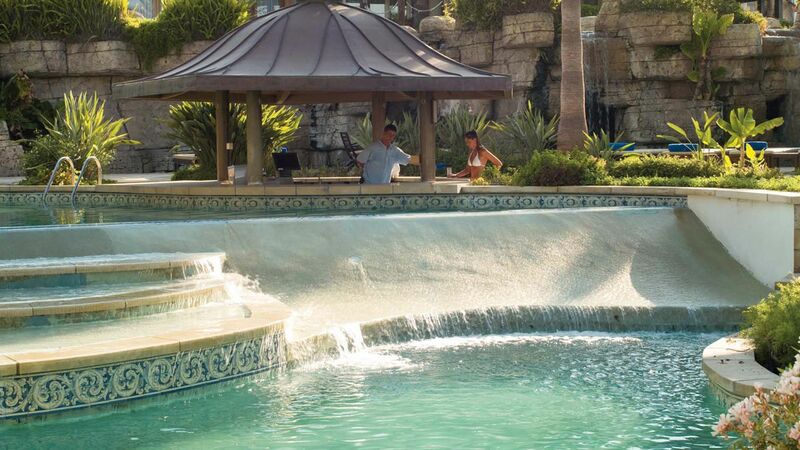 The Grotto is set within the luscious gardens and full of meandering pools and streams, waterfalls and a swim up bar. Guests can also enjoy the new rooftop indoor swimming pool. The Annabelle Hotel is set right on the seafront where you can relax on sun loungers or choose drinks and snacks from the Mediterraneo Bar. A rooftop retreat of tranquility, the spa offers beauty treatments, spa packages, massages, facials and more. Children under 16 are not permitted at the spa. The tennis and squash courts at the Annabelle Hotel are perfect for those wanting to keep active during their stay. The tennis courts are floodlit in the evening. The hotel’s expert sommelier will take you through some of the world’s most famous wines, followed by a three course meal. Learn how to create typical Cypriot dishes with a skilled chef. Located in a pretty bay next to the golden sands of Alykes Beach, the Annabelle Hotel is ideal for those wanting to simply relax and unwind. Nearby you’ll find a host of water sports, pretty secluded coves and Blue Flag awarded beaches ideal for families with children. 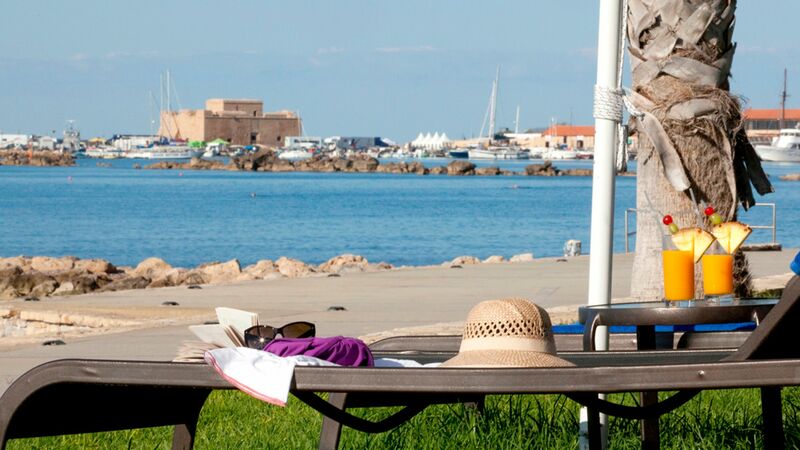 If you prefer to explore the bustling town, Paphos’ centre is just a short walk away. Here you’ll find a busy marina area where you can relax in one of the bars and restaurants, or watch the boats come in. The cobbled streets of the old town are typical of a picturesque Cypriot village, with pretty cafés and family run tavernas to be discovered throughout. Annabelle Hotel is a 20 minute drive from Paphos Airport. Inland View rooms feature either twin or double beds, marble bathrooms with a walk-in shower and a balcony with views towards the town and/or the hotel. Guests can enjoy complimentary Wi-Fi available in all rooms. Terrace Garden View Rooms are located on the ground floor, opening into hotel's tropical gardens, and feature a private terrace with table and chairs. Guests can enjoy complimentary Wi-Fi available in all rooms. Side Sea View Rooms are bright and airy in design and offer a furnished balcony for guests to relax. The room can have a double or twin beds on request. This room is available to book for travel from 01 May 2019. Sea View Rooms enjoy views of the sea and the hotel's tropical gardens. Please note that these rooms do not directly face the sea, choose a Deluxe Sea Facing Room with Balcony if you wish to have a full sea view. Guests can enjoy complimentary Wi-Fi available in all rooms. Terrace Rooms Sea View are located on the ground floor with views of the sea and the pools and have a large terrace with table, chairs and a private sun lounger. Guests can enjoy complimentary Wi-Fi available in all rooms. Deluxe Sea Facing Rooms with Balcony have uninterrupted views of the Mediterranean Sea and Paphos Harbour from their spacious balcony. These rooms have larger bathrooms with a separate walk-in shower. Guests can enjoy complimentary Wi-Fi available in all rooms. Garden Studio Suites are situated in the hotel's gardens facing the sea. They are Greek in style and consist of a bedroom with an open-plan sitting area and two private patios. Guests can enjoy complimentary Wi-Fi available in all rooms. Studio Suites are situated on the first floor of the hotel with views across the Mediterranean Sea and Paphos harbour. They feature an open plan bedroom with living area and a large bathroom with walk-in shower. Guests can enjoy complimentary Wi-Fi available in all rooms. Studio Suites with Pool are situated on the ground floor of the hotel with views across the Mediterranean Sea and Paphos harbour. They feature an open plan bedroom with living area and a large bathroom with walk-in shower as well as a terrace with their own luxurious outdoor heated plunge pool. Guests can enjoy complimentary Wi-Fi available in all rooms. Garden Studio Suites with Outdoor Whirlpool are situated within the hotel's gardens, are sea-facing and consist of an open-plan bedroom with living area plus two private patios, one of which features a private heated whirlpool. Guests can enjoy complimentary Wi-Fi available in all rooms. One Bedroom Superior Suites feature a bedroom, separate living room with dining area, a luxurious marble bathroom with a Jacuzzi® bath. They have spacious balconies which are furnished with sun loungers. Guests can enjoy complimentary Wi-Fi available in all rooms. The Family Inland View Interconnecting Rooms are ideal for families and can accommodate up to 2 adults and 2 children. They have two bedrooms, two bathrooms and views of the town and/or hotel from the furnished balcony. Guests can enjoy complimentary Wi-Fi available in all rooms. Family Sea View Interconnecting Rooms are great for families and can accommodate up to 2 adults and 4 children. They have two bedrooms, two bathrooms with a walk-in shower and views of the sea from the furnished balcony. Guests can enjoy complimentary Wi-Fi available in all rooms. Family Studios have views of the hotel's gardens, or partial sea views. They consist of a bedroom with an open-plan sitting area. The majority of Family Studios open directly onto a private terrace. Guests can enjoy complimentary Wi-Fi available in all rooms. Save up to 15% discount on the hotel price for holidays between 08 – 30 April 2020 booked by 31 March 2020. A minimum of 5 nights stay is required for the above special offer. Save up to 10% discount on the hotel price for holidays between 01 November 2019 - 31 March 2020, booked by 31 October 2019. For guests staying for a minimum of 5 nights for holidays until 30 April 2020, booked by 31 October 2019. (dinner to be taken at the Fontana Buffet restaurant, no allowance is given when dining in any other restaurants and dinner cannot be exchanged for lunch). Children receive a free upgrade to half board or full board when two adults book on same terms for holidays between 01 April 2018 – 31 October 2019. Three children under 12 years old sharing own room will be charged the double occupancy rate for holidays between 01 April 2018 – 31 October 2019. Two children under 12 years old sharing a room with one adult will be charged the applicable double occupancy rate for holidays between 01 April -31 October 2019. One child or infant under 12 years old sharing a room with one adult stays free on parent's booked terms and the parent will be charged the applicable single occupancy rate for holidays between 01 April 2018 – 31 October 2019. Family offers are based on selected rooms types, please call our Trusted Adviser for further details. Couples receive a welcome drink upon arrival, fresh seasonal fruits, flowers, chilled sparkling wine in room on arrival, complimentary upgrade to the next room category (subject to availability on arrival) for holidays of a minimum of 3 nights stay until 30 April 2020. Proof of marriage must be provided on arrival. Book a minimum of 21 nights and receive one free night stay for holidays between 01 November 2019 - 30 April 2020. Very good location, great for young families and also those seeking peace as there are very separate areas and restaurants. We had 2 nice adjoining bedrooms a bit small but fine. Cost about ?? ?300 a night with half board and good meals. Very good location easy walk along promenade to Pafos Harbour. Great access to beach with own sunloungers by the sea. Close enough to airport 20 min taxi. Cyprus is expensive compared to the part of Greece I usually go to (Evia). However this is a very nice and convenient hotel. Why not 5 stars? It's not perfect but it is pretty good. “ 4th visit and still 5 stars! Back again to this superb hotel. It is beautifully kept, located and has excellent facilities. 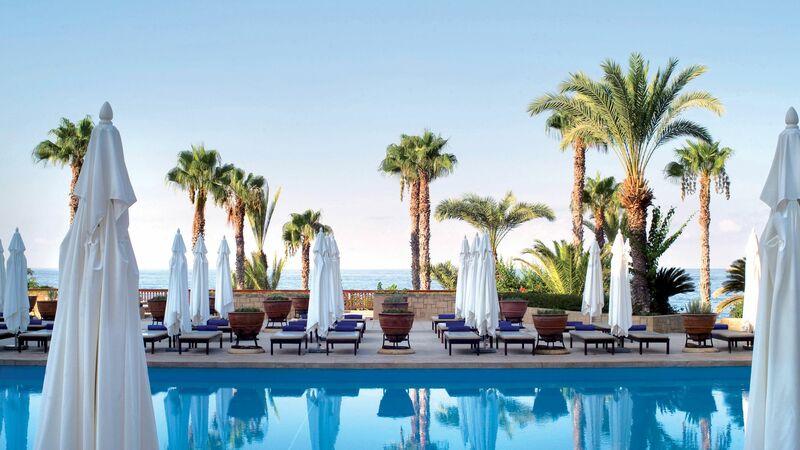 But, honestly, there are a lot of modern hotels in Paphos, but it is the staff in the Annabelle who always exceed 5 stars and make this a very special place to stay. We found the Annabelle an excellent break away. Despite one or two minor glitches the overall holiday was very good. The staff were very polite at all times and the Fontana restaurant was always a good choice with food cooked to a high standard although possibly a bit repetitive in choice. we would not hesitate to return at a future date. Everything about this hotel was excellent. Beautiful room (we got a free upgrade to a duplex suite) with fantastic views and so clean. Lots of little touches made it really special. Location was excellent, pool area was beautiful and so well looked after. Choice of 4 restaurants - our favourite was the mezze plates in the beach restaurant and we also ate at Ouronos which was amazing. Great breakfasts and nothing was too much bother for the staff who were all always smiling and helpful. We will come back - can?? ?t wait! We stayed again at this hotel and chose it for its comfort, position and the wonderful staff. The laid back atmosphere at the hotel suits us as we do not want lots of noise or entertainment. This is the otel to stay at if you want rest with all the facilities you require.